Washington Post John McDonald, in charge of security for the school district near Denver that includes Columbine High, talks with his team over the radio last month. 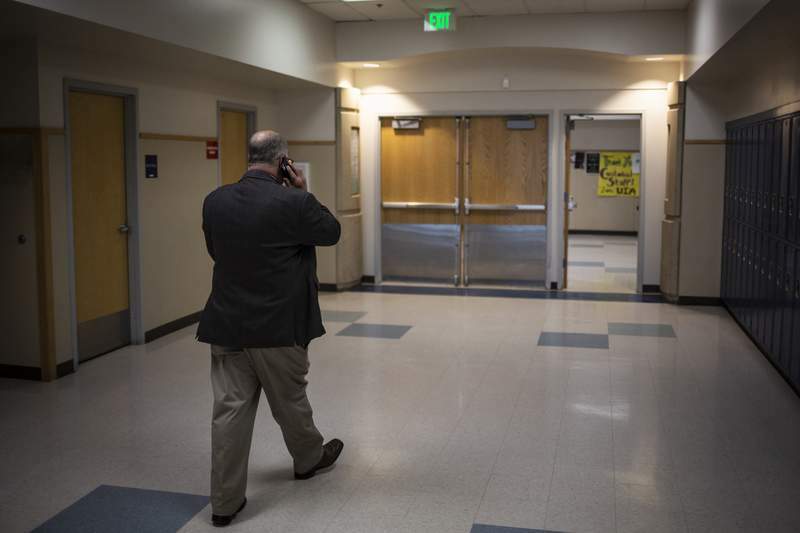 Washington Post Security chief John McDonald walks the halls of Columbine High School as the school nears the 20th anniversary of the shootings that left 13 people dead. LITTLETON, Colorado – Before the call came, John McDonald had finished his breakfast of Diet 7Up, put on his uniform and tucked his Smith & Wesson into its waistline holster. 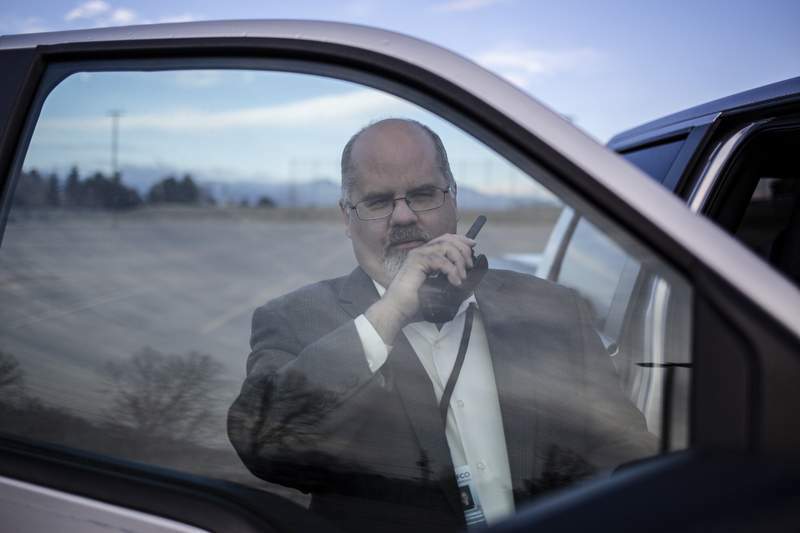 He made it to his office at Jefferson County Public Schools, where he is in charge of safety and security for a sprawling district that includes Columbine High School. On this morning, he even made it to his earliest meeting. Then his phone rang. In a nation always awaiting the news of another school shooting, no community may be braced for that threat quite like the one surrounding Columbine High, a place forever defined by the 1999 attack that killed 13 people, wounded 24 more and ushered in an internet-fueled era of mass violence. Twenty years later – the anniversary is April 20 – Columbine is constantly invoked as the first name in the ever-growing list of campuses turned into crime scenes. Columbine, Virginia Tech, Sandy Hook, Parkland – each addition a reminder that this could happen anywhere, any time. Almost as if it were impossible to stop. The district has built what is likely the most sophisticated school security system in the country: installing locks that can be remotely controlled and cameras that track suspicious people; setting up a24-hour dispatch center and a team of armed patrol officers; monitoring troubled students and their social media; getting training from world-renowned psychologists and former SWAT commanders; researching and investing, practicing and re-practicing, all to ensure that when the next significant threat comes, it is stopped before the worst happens again. At the center of it all is McDonald, a 50-year-old police officer turned security expert who took the job 11 years ago because his only daughter was going to attend Columbine. Today, he is responsible for the safety of 157 schools and 85,000 students in a community that long ago stopped talking about a need for healing or forgiveness and started focusing on recovery and preparation. The officer who called McDonald was stationed inside one of the county's other high schools. It was a Tuesday in March, one month before the 20th anniversary. There was a rumor, the officer said, that someone was going to shoot out the school's windows. Without McDonald giving an order, everything he had put in place to respond to threats was already in motion. More officers had been dispatched. Areas were being searched. His team and the local sheriff's department would interview students, teachers and administrators until they felt certain there was nothing they had missed. Because what McDonald had learned, what he had preached around the country was this: Every threat counts. Nearly all past school shooters gave some indication of what they were about to do. They bragged to friends, wrote it in an essay or made what seemed at the time like just a bad joke. The teenage Columbine shooters did so. The next shooter likely would, too. With the anniversary approaching, the intense and sometimes disturbing interest in Columbine that has long festered on the internet is spilling into the real world with greater frequency. Every day, multiple times a day, people show up at the high school. McDonald's team usually stops them before they can even step out of their cars. Some explain that they just wanted to pay their respects to the victims. Others claim they are in love with the shooters, Eric Harris and Dylan Klebold, who killed themselves inside the school. More than 150 of these strangers were showing up every month. The planning for the anniversary was under way. And now there was one more threat to handle from one of the district's own students. In 1989, McDonald's older sister Christy was assaulted, strangled and stabbed to death by a stranger who broke into her condo. The man was caught, and while McDonald was attending the criminal hearings, he was also working to become a police officer. His sister's attacker eventually killed himself in jail. McDonald became an expert in violence prevention. In the world of school safety, so many of the practices taught in 2019 have their origins in all that went wrong in this place in 1999. The spot where McDonald parked was not far from where law enforcement had formed a perimeter around the school. Police did not go into the building until a SWAT team arrived. Today, officers are trained to enter immediately and take down the shooter. The radio McDonald was using to talk to dispatch also connected to the area's other first responders and law enforcement agencies. Twenty years ago, schools, police and emergency medical services had no single frequency on which they could all operate, causing chaos. They also didn't have a blueprint of Columbine when they arrived. Now McDonald keeps detailed floor plans of all 157 schools in his trunk, along with extra ammunition, a bulletproof vest and a sledgehammer. He stepped out of his car and appeared on one of the school's dozens of security cameras. More were being installed before the anniversary. He entered through a door his dispatchers have the capability to lock or unlock. Each classroom he passed was equipped with a deadbolt that locks from the inside. No more teachers stuck in the hallway, fumbling with a ring of keys. The students he passed were all trained in what to do if a shooter entered the building, and all 1,700 had received a handbook outlining what would happen if their own behavior indicated they might be a danger to themselves or others. School officials perform hundreds of threat assessments a year, bringing Jefferson County students and their parents in to analyze their actions, social media posts and mental well-being. The close monitoring sometimes continued even after a student graduated. She didn't have to ask what he meant. Everyone at Columbine knew about the “lookiloos,” as one dispatcher called them. McDonald estimated that more of these gawking strangers had shown up at the school in the last four years than in the first 16 combined. McDonald and others say false information about the shooters reported in the early days after the attack – that they were social outcasts enacting their revenge – has emboldened those who fantasize about following in their footsteps. Then he stepped into a meeting where the details of that plan were being dissected once again. Seated around a conference table was the group of current and former Columbine staff, students and law enforcement who have spent months organizing the 20th-anniversary events – a week of service projects and ceremonies. There will be a rally for current students, a public memorial service for thousands and a private open house for survivors who want to visit the building. Some who RSVP'd have not been inside the school since they ran out of it on April 20, 1999. Scott Christy's days are spent leading meetings, talking with parents, observing classrooms, planning for prom – running Columbine, the school, a place filled with students who weren't even born when the attack happened. “Ninety-eight percent of the time, maybe more – 99% of the time, it's just a school. We're doing our best to prepare our kids for the future,” the current principal said. It happens after every new school shooting: The media call, strange emails and outsider threats spike. Christy, 42, tries to remain unfazed; he knows McDonald's team will tell him when there is reason to worry. But that has been far harder in the past few months, since the threat received before Christmas. The callers claimed there was a bomb and someone with a gun in the school. Within a minute, McDonald's team and the sheriff's department were inside searching for them. Christy was alerted immediately, but he wasn't at the school. It was the rare day when he was at the district's headquarters, 30 minutes away. He ran to his car and sped down the highway at 100 mph. When he made it to Columbine, the school was surrounded with police cars blocking his way. “I'm the principal,” he pleaded. The officers wouldn't let him by. Christy flung his car door open and sprinted toward the school. “We've got a runner!” McDonald heard someone say over the radio. When he realized what was happening, he ordered that Christy be let in. By then, McDonald was sure that the threat was a hoax. Three months later, Christy was still finding it difficult to be away from the school, he confided to McDonald, who had stopped by his office. Local law enforcement was already sending officers to the houses of the students involved. They were working to find out whether the 19-year-old had access to weapons. McDonald told the dispatcher he wanted one of his own officers stationed at the school that could be targeted. The mental health hold would buy them time; they just didn't know how much. His phone rang again. The school system's chief operating officer wanted to be filled in. The sound of his ringtone woke him up at 2:13 a.m. The sheriff's department was calling. He listened to find out how bad this one was going to be.